Where can you find Leo the lion? How can you bring a constellation into your room? What are the oldest stars? How did the Milky Way Galaxy get its name? 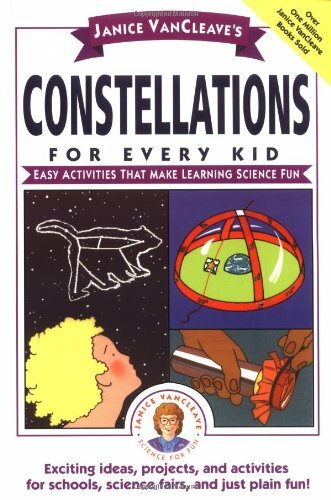 Now you can explore the answers to these and other questions in Janice VanCleave's Constellations for Every Kid. Find the constellations Draco, Libra, Hydra, Hercules, and many more from your own backyard. Make a star disk that can track star movements. Find out what a balloon can tell us about stars. 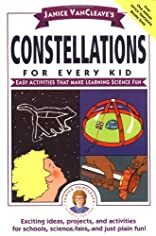 With activities like making an astronomer's flashlight and a shoebox planetarium, Janice VanCleave's Constellations for Every Kid will have you reaching for the stars. Each of the activities begins with a statement of purpose, followed by a list of materials, step-by-step instructions, expected results, and an easy-to-understand explanation. Every activity has been pretested and can be performed safely and inexpensively at home or in the classroom.